In a story as old as time, a group of self-proclaimed woodsmen venture off into the woods to learn a valuable lesson: nature gives zero shits. This is the story of the most stressful and uncomfortable wilderness trip I've ever experienced. I'm not saying I envisioned frolicking through bush, skipping down cobblestone paths, and being served mojitos by newly trained bear butlers... But, I definitely overestimated the wilderness skills I obtained by watching re-runs of Survivorman. There's not much for photos, but I hope you'll enjoy my story. I am a much more humble man because of it. Including myself, we were a group of seven: Matthew, the dizzy; David, the mustard bringer; Conan, the vegetarian; Sean, the nervous; Nathen, the one who packs nothing but mangoes and beer; and Kyle, the scout master. Kyle was the most experienced woodsman in our group. I could imagine things turning out much worse had he not come along, yet he was a very strange wilderness guide. He believed in letting you make your own mistakes, though most of his advice is delivered in grunts, moans, giggles and awkward touching. Our setting was McDougal Creek, a trout stream that marked the north-eastern border of Narrow Hills Provincial Park, Saskatchewan. The plan: hike the length of the river mid-June 2013, camp 3 nights between the drive-up camp ground and an old logging road where we left the car, roughly 8 km [Map]. Shouldn't be too bad. We met up the first night at our drive-up camp site near the creek. The first of many bad omens was observed: Conan brought a cooler full of meat and beer, an 8-person gazebo tent, and a broad sword. I must have communicated my plans poorly as the entire group showed up with picnic gear. I was the one who planned the trip and still managed to skimp on my shelter... It was a $3 hammock from Value Village with the world's worst tarp picked up from the general store. The mosquitoes were merciless. After a night boozing around the camp fire and eating our entire supply of perishable food and meat, we packed our bags and lazily head on our journey around noon. We travelled about 2 km before deciding to set up a new camp and take it easy. Initial confusion aside, the trip was turning out to be a lot of fun. 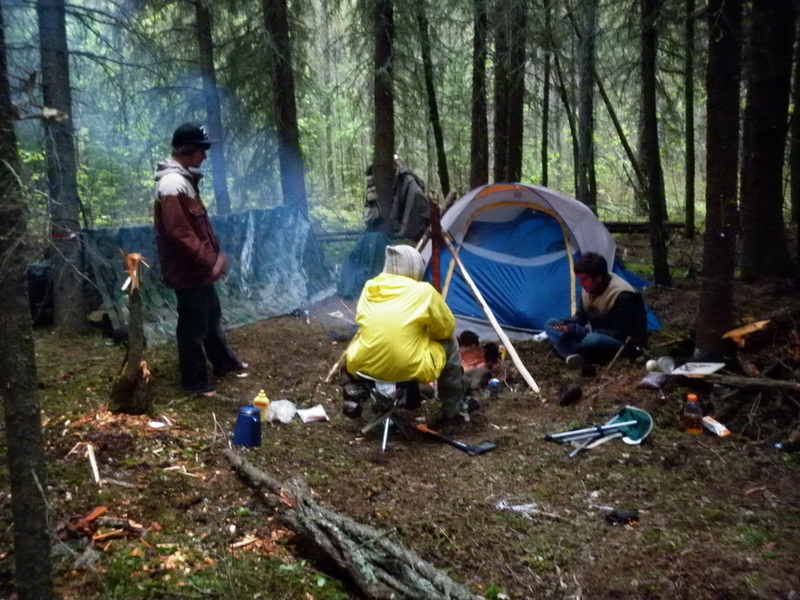 We built a camp site in a clearing near the river, fished for a couple small brook trout, and cooked around the fire. Around sundown, I realized this was the first trip we've ever been on in complete unincorporated wilderness. We were in the middle of nowhere, in a place we've never been before, and no one expected us home for days—it was awesome. Time flew by until I found myself alone, rocking in my cheap hammock underneath the stars. The mosquitoes were no longer biting and I fell asleep to the sound of running water. I could get used to this. The next morning was another story. Our fire was long dead and the mosquitoes were out in full swing. Nathen awoke from a cold uncomfortable night, having slept on the ground with nothing but a tarp hanging over him. Sean's tent collapsed overnight requiring him and Conan to sleep in improvised tarp-hammocks. Lastly, a front had moved in, bringing non-stop rain and a drop in temperature. The day looked miserable and we knew we had to make at least 4 km to put a dent in our hike. 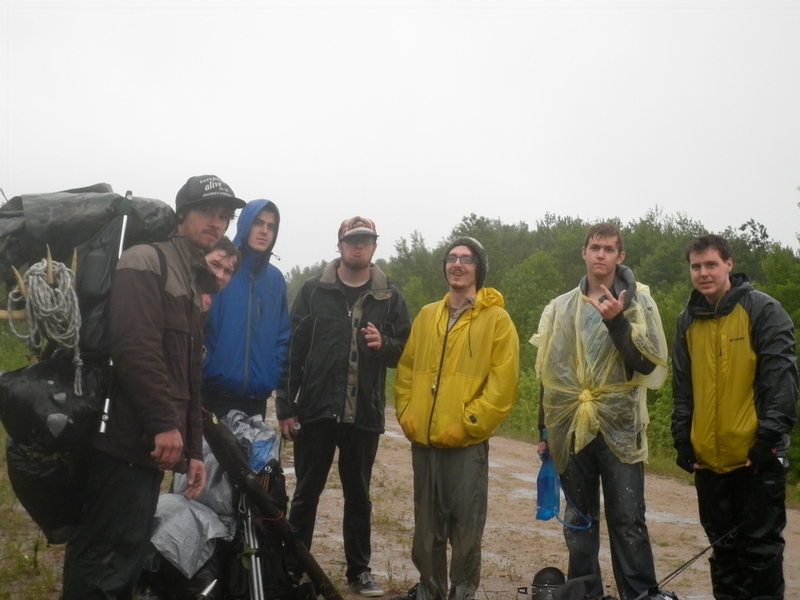 Reluctantly, we packed our soggy gear and trudged through the rain-soaked bush. Trivia: Narrow Hills Provincial Park gets its name from the prominent eskers and push moraines throughout the park. Sharp rises in elevation coupled with the fact the forest has had its fair share of forest fires makes for some tough bushwhacking. The hills are exhausting on their own and the woods are so dense that many spots are just plain impassible. Within a meagre 20 minutes of hiking up and down these hills, we committed a major party foul: we sweated... a lot. The rain continued to fall and the thought of hypothermia came to mind. Our gear, which started out at a "modest" 50 lbs each, was now saturated with rainwater. Conan still had his broad sword to carry. Most of us did not think to wear anything besides cotton shirts and thin rain jackets. And what else? The crappy topographic map I printed out was almost illegible. We decided to take a break after reaching what had to be the halfway point. After 30 seconds of rest, we were shivering. A new reality set in... We would either stay the night and risk getting dangerously sick, or try to finish the trek in one day. On either hand, there was still a chance that we were travelling in the wrong direction. We uneasily decided to keep moving. An hour later, things were tense. Our map was useless, our compasses were cheap garbage, and one thing was blatantly clear: we had a serious lack of leadership. Fair enough. Nobody wants to be responsible for the death of their best friends. So we argued about which way was east and west, and whether to take the high land - losing sight of the river - or risk a broken ankle trudging through the overgrown muskeg lowlands. Kyle became our de facto leader. We simply gauged his mood to indicate whether we were about to do something stupid. Not the most ideal shoreline for hiking. We continued fighting our way through impassible bush travelling at a snail's pace. Each river bend gave us a glimpse of hope, immediately followed by dread and disappointment. I was beat down by anxious thoughts. How far have we actually travelled? Was this even the same river? How long would it take until someone snapped an ankle? 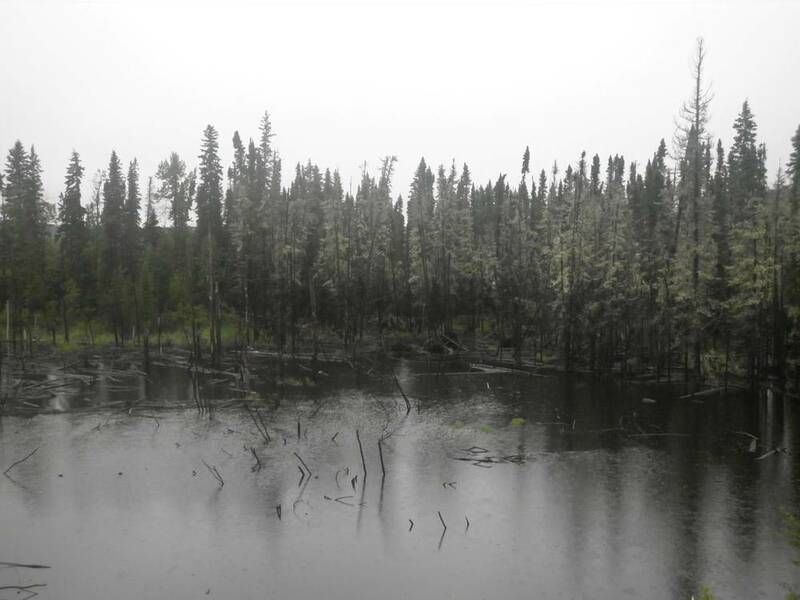 We trudged our way through another muskeg, our minds detached from our aching bodies. We clung to anything for morale: a conversation, a sign of humanity, a patch of blue sky, a joke, whatever it took to stay sane and keep moving... David squirted a bottle of mustard everywhere. Strangely enough, this gave us a new burst of adrenaline. That was until Kyle mentioned we created a delicious trail leading directly to our group through Saskatchewan's most infamous bear country. We hiked constantly for six hours. Every muscle in my body screamed and begged for rest. I looked at my brother Matt to check on him, but my face gave me away. I was scared. I wanted to collapse, but seeing my brother hike through thorns and ravines wearing cheap water shoes inspired me to stop being a pansy. We just needed to get the hell out of these woods. While blazing our trail, Nathen spotted a bear-bait barrel. Just the thought of knowing someone was here at one point was enough to lift our spirits and pick up our pace. We got another boost as we walked by chainsawed trees, leading us to an ATV trail. We were all sick of the woods so we took a chance by following the trail which could lead in the wrong direction. Lucky for us, we found our way to the gravel road. After a short walk, we saw the car. I would never forget this relief. We jumped and cheered, you would think we won the lottery. We were so drenched at this point we might as well have been pulled out of a lake. We escaped down the waterlogged fire road and searched out a cabin to rent for the night. The only accommodations available were shabby rooms for truck drivers. It might as well be the Delta Bessborough for all I care. We turned up the heat, dried off, chugged several pots of coffee and ate enough poutine to kill John Candy. The next morning, Sean and I left for Regina, triumphant over the soggy clutches of nature's bosom. We were driving for hours, revelling in our newfound wilderness experience, when we came upon a road block. The highway was flooded. Eager to get home, we mapped a new route and set out on our detour. We were 50 feet down a gravel road before realizing it was just waterlogged mud. The car was completely stuck, unable to move another inch in. We called for a tow, but no one would do it in the wet, past 6 pm on Father's day. We had to walk and find find help. Then, it started raining again.